1. 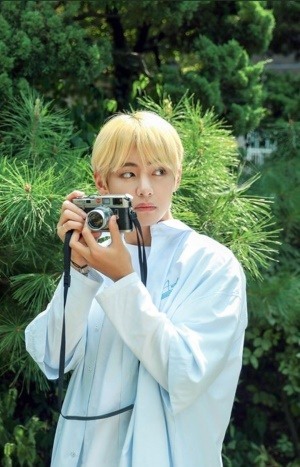 His real name is Kim Tae-hyung. 3. V was born in Daegu on Dec. 30, 1995. Later, he moved to Geochang County, South Gyeongsang Province. 4. He is a dancer and a vocalist, known for his deep, husky voice. 5. 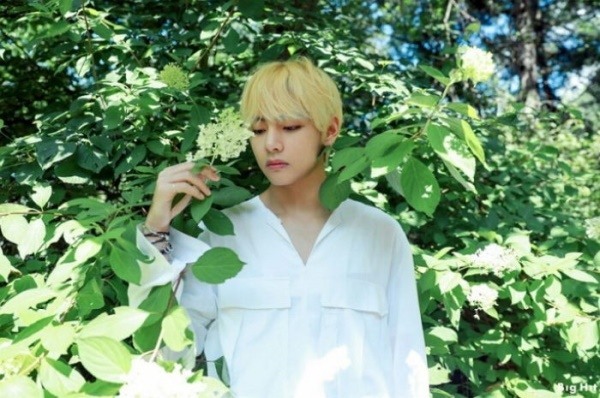 V said if he hadn’t become part of BTS, he would have become a farmer and worked with his grandmother pulling up weeds. 6. He played the saxophone for three years in middle school. He thought about becoming a saxophonist, but he decided he liked singing more. 7. He became a trainee for Big Hit Entertainment after passing an audition in Daegu. 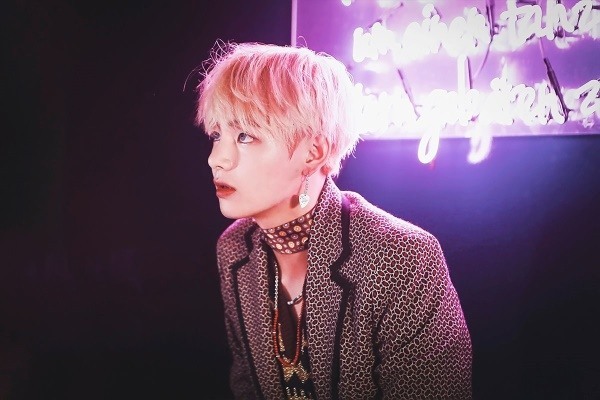 Big Hit kept V under wraps until his debut, and he was the last member of BTS to be revealed to the public. 8. He is the eldest of three children, with a younger brother and sister. 9. 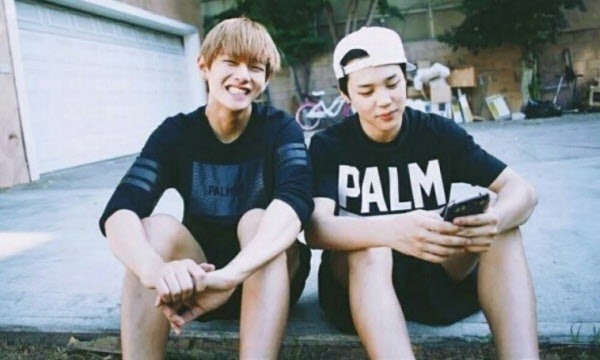 V’s role model is his father, whom he describes as a good listener who takes good care of his children. The singer’s goal in life is to be just like his dad. 10. His all-time favorite film is the Korean movie “Miracle in Cell No. 7,” which made him cry. 11. His blood type is AB. 12. He is 178 centimeters tall and weighs 63 kilograms. 13. V’s favorite color is gray. 14. His favorite songs include “Hello in There” by Joan Baez, “Blue Room” by Chet Baker and “Every Kind of Way” by H.E.R. 15. V doesn’t like coffee because of the bitter taste. But he likes drinking hot chocolate. 16. V doesn’t like vegetables. 17. 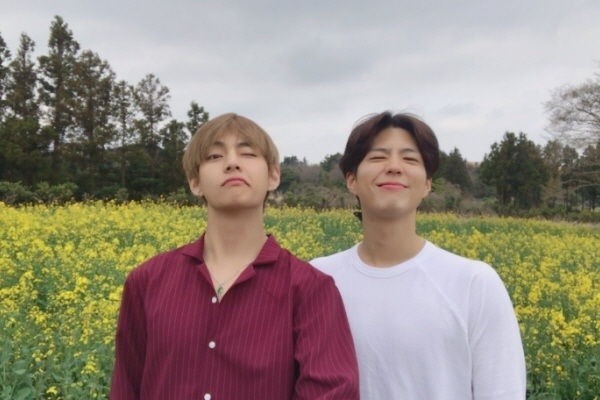 He is good friends with other popular celebrities, including actor Park Bo-gum, whom he got to know when they co-hosted “Music Bank.” He is also good friends with BTOB’s Sungjae, with singer-actor Park Hyung-sik, and with SHINee’s Minho, EXO’s Baekhyun, actor Park Seo-joon and actor Kim Min-jae. 18. He is interested in photography and is inspired by the works of Sydney-based minimalist photographer Ante Badzim. He uses the hashtag #Vante for his photographic works, in tribute to the artist. 19. 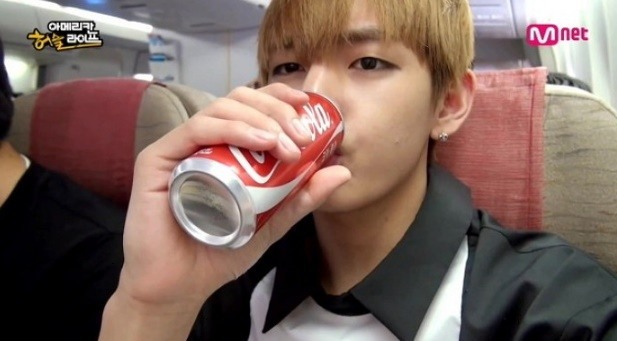 V’s ideal woman is thoughtful, cares for him a lot and uses money wisely. He likes long-haired women who are chic on the outside but have warm hearts. He picked Lily Collins and Rachel McAdams as his Hollywood crushes. 20. V said his long, thin hands were the part of his body he’s most confident about. 21. 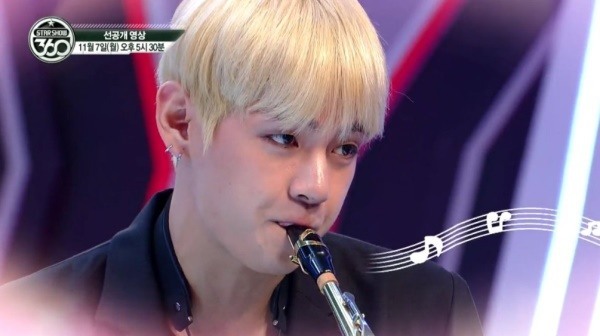 V likes classic and jazz music. 22. V likes the Italian luxury brand Gucci, and he is frequently spotted wearing the brand. 23. V can speak Japanese very well. 24. V doesn’t drink alcohol. He drinks Coke instead of beer. 25. V is enrolled in Global Cyber University, having graduated from Korean Arts High School. 26. V has a dog named Soonshim, who lives with his parents. His new puppy, a black teacup Pomeranian named Yeontan, lives with him now. 27. Playing basketball and bicycling are his favorite sports activities. 28. His bucket list includes traveling with his family, having at least three to five kids, and getting Soonshim married. 29. V’s favorite foods include japchae, any type of meat and potato pancakes. 30. 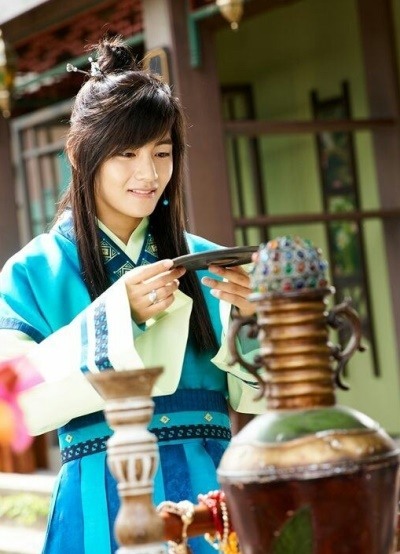 V made his acting debut on the KBS drama “Hwarang” in 2016. He says he got acting advice from actress Ha Ji-won, who is now a good friend. 31. American musicians Ruben Studdard and Eric Benet are both artists who inspired V.
32. When he was a student he liked music and PE, but he didn’t like math. 33. He likes collecting clothes, shoes, hats and jewelry. 34. V likes going to art galleries. He said one of his favorite moments during BTS’ US tour was going to MoMa in New York City and the Art Institute of Chicago. 35. 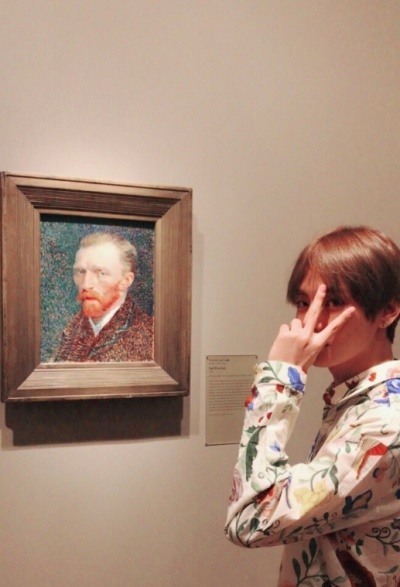 He loves the paintings of Vincent Van Gogh. 37. He has a habit of biting nails, as well as opening his mouth and touching anything that is cute. 38. His bandmates say he has the most outgoing personality in the group. 39. V likes going to amusement parks. He was spotted going to Lotte World with actor Park Bo-gum. His ideal date is going to an amusement park and holding hands. 41. 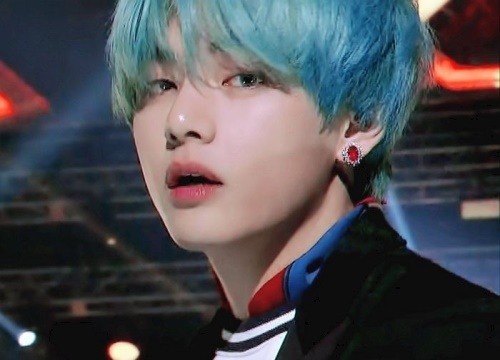 In 2017, V’s face was picked as the most handsome in the world, topping TC Candler’s, on the annual list of the 100 Most Beautiful Faces of the Year. 42. V is a big fan of the girl group Girls’ Generation. 43. V said he hasn’t been in a serious relationship yet. His hope is to marry his first love. 44. V is originally left-handed, but he can write with his right hand too. 45. Actor Ansel Elgort is a good friend. Elgort even once changed his Twitter profile picture to one of V.
46. V’s Myers-Briggs personality type is ENFP: extroverted, intuitive, feeling and perceiving. 47. V’s skin care treatment on the plane includes soaking cotton pads with toner and putting on twice as much lotion. 48. 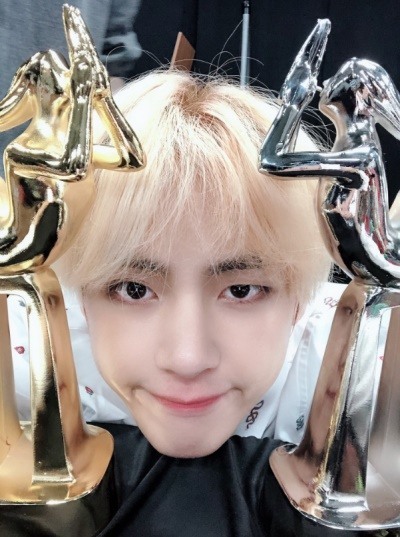 V is the second-youngest member of the seven-piece act, after Jungkook. 49. He is moved when someone buys him pretty clothes, and happy when he gets to sleep. Eating jjajangmyeon gives him energy. 50. V is featured in a 2019 Korean elementary school textbook in a section describing different careers.